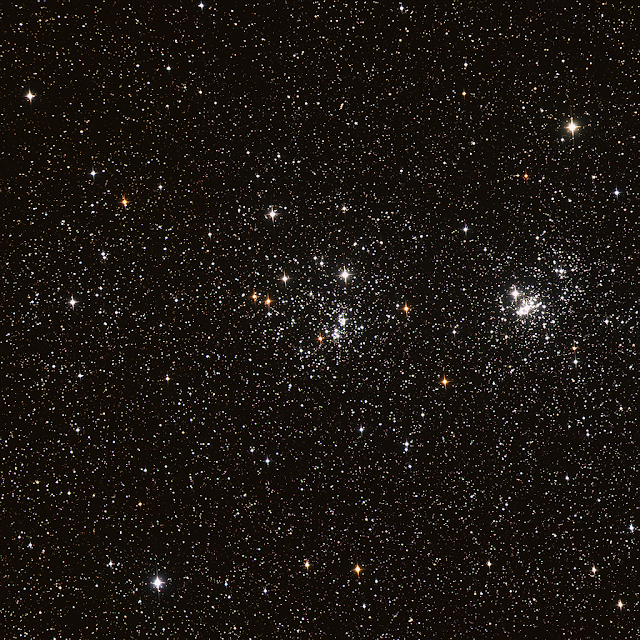 The Double Cluster is the name for two open clusters, NGC 884 and NGC 869, and are located close together in Perseus constellation. Also known as h Persei and χ Persei (h and Chi Persei), the open clusters both lie at an estimated distance of 7,600 light years from Earth and are roughly 12.8 million years old. The Double Cluster is circumpolar (continuously above the horizon) from most northern latitudes. These deep-sky wonders are in proximity to the constellation Cassiopeia and are approximately the radiant of the Perseid meteor shower, which peaks annually around August 12 or 13. The Double Cluster - NGC 884 (left) and NGC 869 (right) - Imaged by Michael Petrasko on Insight Observatory's Astronomical Telescope for Educational Outreach (ATEO-1. NGC 884 and NGC 869 covers an area of 60 arc minutes of the apparent sky, which is twice the size of a full Moon making it a suitable target for backyard telescopes and binoculars. Individually, the clusters have a mass of 3,700 solar masses (NGC 869) and 2,800 solar masses (NGC 884), but as each cluster is surrounded by an extended halo of stars, the total mass of the Double Cluster is at least 20,000 solar masses. 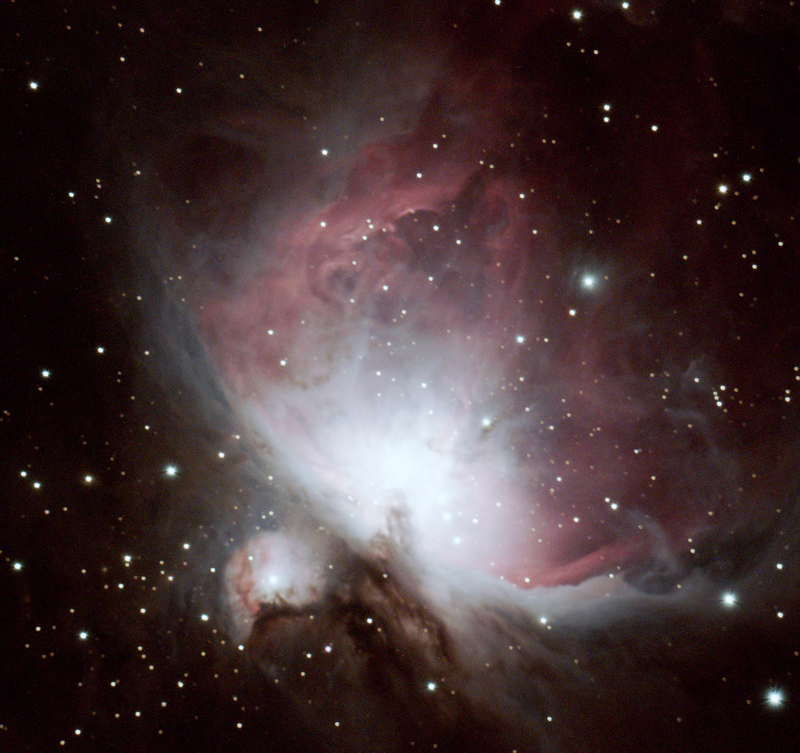 The two clusters are separated by only hundreds of light years. Each open cluster contains 300 to 400 stars and the brightest stars shine at 7th magnitude. NGC 869, appears slightly brighter, richer, and more compact than NGC 884. Hipparchus, a Greek astronomer, catalogued the object as a "patch of light" in Perseus as early as 130 B.C. However, the true nature of the Double Cluster wasn’t discovered until the invention of the telescope many centuries later. In the early 19th century William Herschel was the first to recognize the object as two separate clusters. 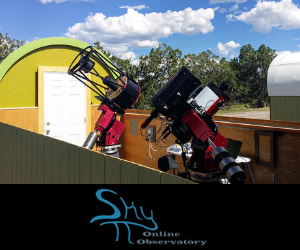 The Double Cluster is not included in Messier's catalogue but is included in the Caldwell catalogue of popular deep-sky objects, designated Caldwell 14.